Do you know what to do when your child misbehaves in front of others? See the one mistake you may not even know you’re making. The lady, the boy, me… we all wished we were somewhere else, not caught in this moment. Everyone stood on edge—except the father. “No. Come back here. You need to apologize to this lady,” the father said to his son, about seven-years-old. I was at Target, alone (hallelujah! ), in the baby aisle when this scene played out. The boy had bumped into this other lady and kept going, oblivious to having hit her on accident. The dad, meanwhile, wasn’t too happy about that. So he made his son apologize to the lady. And he still wasn’t happy when his son mumbled his “I’m sorry.” No, he wanted the apology said out loud. Meanwhile, the lady kept saying “It’s okay” and trying to brush it off. Probably to get on with her shopping instead of standing here being privy to a parenting lesson. The dad kept insisting until he finally heard what he felt was a good enough apology before moving along. First, a note: I don’t even think the boy “misbehaved” in the above scenario. I say “misbehave” to mean any behavior your child does you’re not too pleased with. Forgetting to apologize isn’t misbehaving, but something the dad wanted to correct. I can see why parents would want to discipline their children right away, even in front of strangers. We could feel embarrassed about their behavior and want to make sure others know we don’t tolerate it. We want to use the opportunity to tie in a teachable moment before our kids forget and don’t want others to see us as the parent who lets things fly. Or maybe we’re used to addressing it right away at home that we forget we have an audience with others around. Thing is, discipline in front of others is humiliating for your child. It’s bad enough for him that he did something he shouldn’t have or forgot to do something he should’ve. Now he’s put on public display. Having an audience makes it more unlikely your child won’t learn a lesson at that moment. He’s more concerned with saving face or brushing aside embarrassment. He doesn’t want to be on the spot. Any chances of this being a “teachable moment” pretty much has to wait until you’re alone with him. Not only did the seven-year-old feel uncomfortable, but so did the lady and even me. Yes, our intentions to correct our child’s behavior and apologize to others are noble. But forcing him to do so just makes it more awkward for everyone else. Whether bumping into someone or being outright rude, you should correct your child’s behavior. But not right then and there, and not with an audience. For instance, what could the dad have done instead of forcing his child to say sorry? He could’ve apologized on his child’s behalf and move on. You’re not letting your child “off the hook” by not making him apologize. If your child is so young you’re reminding him to say sorry, then you’re better off apologizing for him. At least for now. Then later, in private, tell him what happened. Acknowledge his excitement in showing you the cool toy he found. Point out that he had bumped into the lady on accident. And explain that when that happens, it’s best to apologize. And the best part? He’ll be way more receptive to listen and understand when it’s just you and him. Not with a bunch of other people within earshot. Regardless of your intentions with disciplining your child in front of others, it’s best not to do so. Don’t force him to say sorry or correct his behavior right then and there. Don’t lecture or bust out the parenting skills. Instead, apologize on his behalf and discuss it in private. And save everyone—your child and others around—from any more awkward moments. 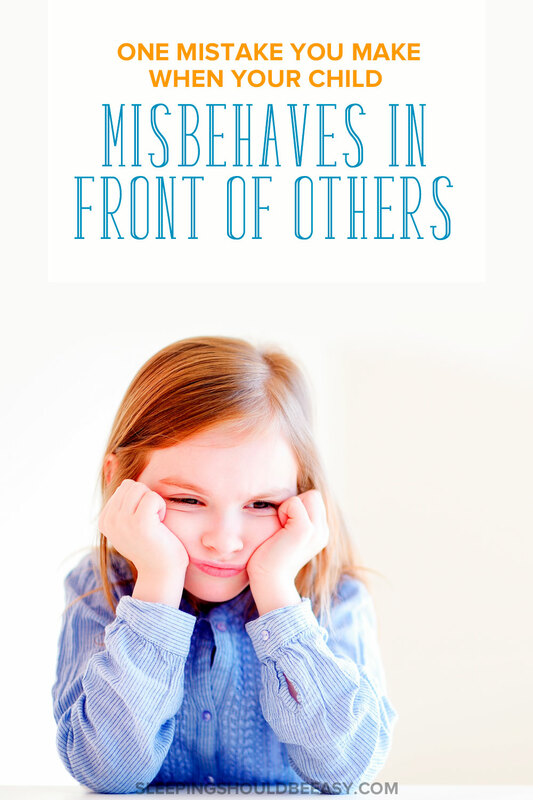 Tell me in the comments: What would you do if your child misbehaves in front of others? Do you struggle with getting your kids to listen? 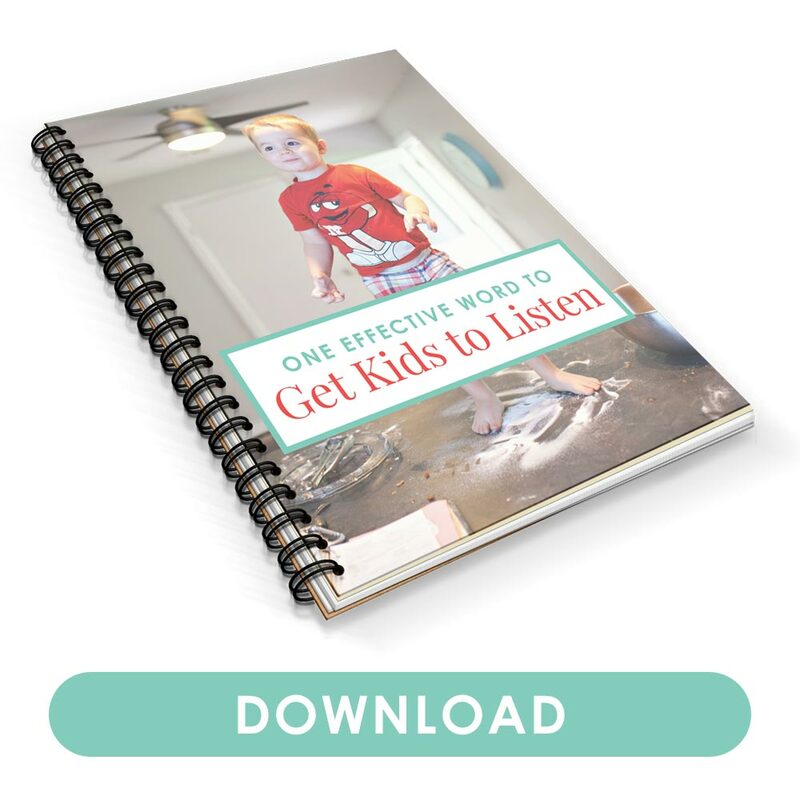 Learn the ONE effective word to get them to listen and follow instructions. 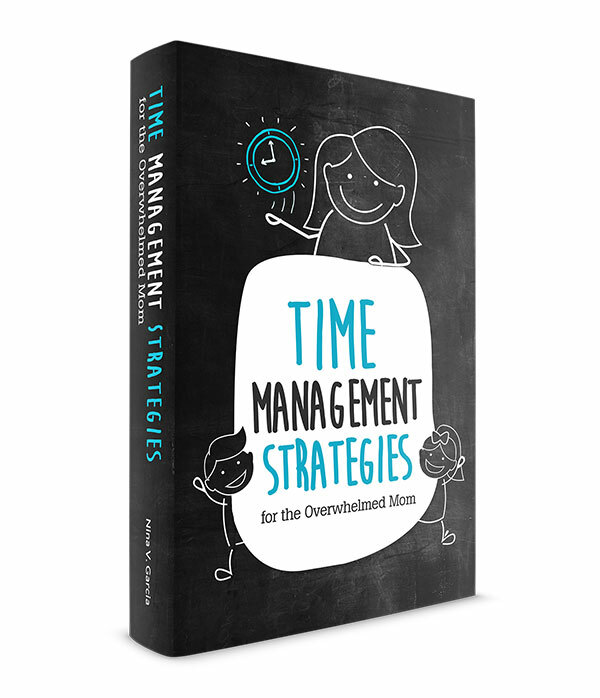 Download my FREE handout and worksheet! Hmm. I’d never thought about it this way, but it sure does make it super awkward for the other adult waiting for a kiddo to apologize (not to mention the kiddo). Right, it’s just awkward all around! What an interesting concept. I think I usually pull Scarlet aside. Not only is it embarrassing for her and others, but it is for me when she misbehaves! Des is three and still hasn’t had too many incidents in public. I’m sure they’re coming. It’s something that you usually don’t think about until you’re on the other side of it lol. oh my gosh – I am constantly apologizing for my kiddos out in public! it’s cold here in the winter months so, we go ‘mall-walking’ in the morning after we take Smoochie Girl to school and I am forever apologizing when the 2.5 year old makes a beeline for the Apple Store across the path of “real” mall walkers 🙂 and, the 1-year just kinda toddles wherever he wants so, there’s that. It’s just all part of the job, right? I can remember apologizing for my son’s behalf because for now, he only says sorry to me even though he didn’t do anything to me directly. So he’s like saying sorry to someone through me. I’ll make note of these tips. This situation can happen quite a lot. Oh that’s so interesting Rea. It’s almost like he knows to say sorry but feels more comfortable saying it to you. Makes sense, especially with kids not wanting to talk to strangers. I couldn’t imagine being that woman being practically held hostage by some stranger just so he could teach his child a lesson. I definitely agree not to involve strangers or other people in the lesson for the moment. However, I have learned with my kids that waiting until we’re in private that the lesson gets lost. She’s already past the moment and could care less. Usually I will apologize on the behalf of my child and give my child a correction in a low tone of voice (so as not to make others too uncomfortable). That’s a good method too, Leslie. I think it ties in both the quick apology and the private lesson. I agree with Leslie, my 4yr son is very active so incidents like this have happened more times than I can count. I always apologize for him but I like to take into account things like the environment (a store, the library, a friends house), the people (public, friends, family), and the seriousness of the incident (outright disrespect, or accidental and unintentional). If he was being rude or nasty I’ll let him know he should apologize, I won’t force him though, he has to learn to evaluate his actions and determine whats the right thing to do. Then when we’re alone I’ll tell him that I’m proud/disappointed by the choice he made. I think it’s good to let them know what they did wrong right when they do it bc its easier for them to make the connection but I don’t agree to discipline or lecture in front of people (unless they’re family, occasionally). It’s totally awkward for everyone and it humiliates your kid too. A quick correction is enough to get his attention (and only his) and let him know to stop or that he did something wrong, the reason why and further consequences can be explained later in private. This is something to think about because as parents we want our children to understand that they shouldn’t misbehave and if they do, they should apologize right then and there. Then again, I understand what youre saying and agree with it. This types of situation can become very awkward very fast. Like you said it’s best to discuss things in private, great advice! Yup, Ros—It’s definitely a balance of seizing the opportunity to discipline with finding the right time to do so. I disagree with this approach. If a child is old enough to go to school then he should be held responsible for his actions. Children respond well to a more structured environment because it makes them feel safe and enables them to explore within certain limitations. Btw, “on accident” is incorrect grammar. You should have said “by ” accident or “accidently”. Cute website! Thanks for your comment, Gina! I agree kids need to be held accountable for their actions. It helps them understand consequences and how much their actions affect others. Good advice since I am prone to correcting misbehavior in public settings.